What if Indiana Jones were a Jewish guy from Brooklyn? Maybe he’d be a swashbuckling economist. He’d make his first million right out of business school. Instead of being a professor of archaeology at some Midwestern college, he’d teach a course in real estate investment at, say, New York University. Then he’d blast off to the frontiers of capitalism–say, Vladivostok, USSR–to create a deal that ties in the Soviet military and the Japanese. But disaster strikes. The KGB decides to frame his point man in Russia–falsely charging the guy with selling tanks to the Baltic States–so the economist has to beat it out of the country, losing $2 million. He uncovers the S&L crisis in his spare time in 1983 and testifies before Congress that it’s going to happen, and nobody believes him. But when it blows up he gets to write a best-selling book about it. Then he sets up shop in Dallas, creating a whole new industry of educational disks on CD-ROM that will go to public schools throughout the country, to save America’s future–and bring in millions. And he’s the kind of guy who can stand up in front of an audience–whether it’s Amway distributors in Texas or insurance executives in New England–and teach them about economics in such an exciting way that he has them on their feet, cheering. Guess what. It’s all true. Indiana Jones is a character out of the movies. But 39-year-old Paul Zane Pilzer, the economist-entrepreneur-professor, has an office in Dallas. We went there to meet him. I’m looking for an economic theory that explains to people, “Oh yeah, let’s do this so I can be rich, and my cousin can make a living.” The existing, scarcity-based theories don’t work. I’ve made a career of demolishing them. I’m trying to formulate a real theory that will help people live better and more successfully, and know what to teach their children. So, most people don’t know where wealth comes from? They’re told that one man’s gain depends on another’s loss. That’s no longer true. We live at a time of change greater than the Agricultural or Industrial revolutions. We are now able to create a potentially unlimited amount of wealth out of worthless matter, using our minds. If you realize that, you’re in a much better position to take advantage of the opportunities that surround us. But I keep hearing that our economy is terminally ill. If you listen to the news, you’ll hear there’s this terrible recession. That’s false. In a recession, there aren’t enough jobs for the people who need them. We have jobs: The daily papers are full of “Help Wanted” ads. What’s happening is that improvements in technology are making certain jobs unnecessary, all the time, and creating new jobs. The musical compact disk industry is bigger than the vinyl record industry it replaced. The news media tells us all about plant closings. What they don’t tell us is that most of the people thrown out of work are rehired in a different job within six months at a 20 percent increase in salary. So there’s wealth out there to pay them? Yes. Both in dollars and in real wealth, our economy is richer than it’s ever been. If you look at retail sales, prices have been down, but the total dollar amount of retail sales isn’t. That means there’s more business being done. And a lot more wealth is being created. But aren’t whole industries declining? Yes. What I’m saying is that the signs of supposed economic decline, such as unemployment, loss of manufacturing jobs, bank failures, don’t represent decline at all, but change. Wealth is being displaced from one sector of our economy to another. In 1930, the U.S. had 30 million farmers who fed 100 million Americans. In the next 50 years, advances in chemistry and biology made food production so efficient that by 1980, even though we had only 300,000 farmers, they produced more than enough food for almost 300 million Americans. Did we lose millions of agricultural jobs? Yes. Was it bad? No. It freed up money and people to do other things and produce more wealth. The same kind of thing is happening today in manufacturing, except it’s happening much faster. Instead of taking 50 years, as it did on the farm, it’s happening within one person’s working lifetime–every 5 or 10 years. Today, people will keep getting wealthier if they can keep learning new skills. What do you call wealth? We live in an age where alchemy is real. The medieval alchemists were looking for the secret of turning base metals into gold, because they believed that God would not have created a world where you can only enrich yourself by making someone else poorer. We are now realizing the alchemists’ dream: We take the basest matter there is–sand–and use it to create the chips that make possible a $150 billion computer industry. Crude oil was a bad-smelling nuisance until human ingenuity figured out how to refine it into a fuel. The lesson is that wealth doesn’t come from gold or oil or land. It’s created by the technology, driven by human ingenuity, that makes those things useful to us. Wealth is unlimited because it comes from our minds. But won’t we run out of raw materials eventually? No. We have more reserves of oil than we did 20 years ago, because we’ve gotten better at finding and extracting it. We’re also using it more efficiently: Computerized fuel injectors have cut gas consumption by cars in half. Copper and timber are being replaced by fiberoptic glass and various plastics. We really create our supply of raw materials by our ingenuity. How did we get saddled with the ideas of scarcity? It comes from what everybody saw when they lived in little city-states a few hundred years ago with a little amount of farmland, in sealed economic units where technology didn’t change over people’s lifetimes. The best way to improve your life at a time when technology changes slowly is to kill the guy next door and take his land. As opposed to improving the technology on your land. But since World War II, technology isn’t just changing over a lifetime–it changes every five years. So, how can people use your insights? Don’t build a business around monopolizing some product or process. Someone will always find a way to do it better or cheaper. The first law of business now is no longer “Find a need and fill it,” but “Imagine a need and create it.” The best source of products or services that satisfy new needs is what I call RITs–Ready-to-be-Implemented Technologies. RITs are technological advances that someone has already achieved but nobody has put to use. Someone invented the electronic fuel injector in the 1970s by applying the microchip to the car fuel system. It was just as easy to use for the driver as a carburetor, but cost $25 instead of $300 and used half the gas. The electronic carburetor applied the microchip to the adding machine. My own company here in Dallas is in the business of applying the CD-ROM to what we think will be the biggest industry of the next century: education and retraining. I designed my own format for creating CD-ROMs–presentation quality. We are the only ones in this business who define ourselves as a publisher, not a software manufacturer. We have a platform to publish magazines, books, the works. That’s our focus. We want to define our business as: Are you an expert or an author with a good idea or valuable information? We want to publish you. I’ll pay you 15 percent. How many people have CD-ROMs? About 3 million. There will be 12 million of these in people’s hands as of December 1993. A CD-ROM drive will be standard issue on all the new computers. We published our first disk with Tony Robbins. John Dvorak, who writes for PC magazine, calls me up. I taught computers while I was at Wharton. My thesis was building a teaching machine on a DEC-20 mainframe. TONY ROBBINS: Yessss! … Hi. This is Tony Robbins. If you’re like most people listening to this CD for the first time, you’re probably hearing my voice on a compact disk player in your home or car. But I want you to know this CD isn’t like any ordinary CD…. This CD contains the full text–over 1,500 pages’ worth–of four national best-selling books, Unlimited Power and Awaken the Giant Within. 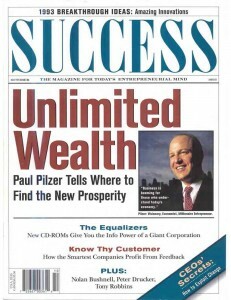 And also, Paul Pilzer’s best-sellers, Other People’s Money and Unlimited Wealth. What got you interested in CD-ROMs? I was addressing a convention of 500 Montessori schoolteachers here in Dallas in 1991. I was explaining, very excitedly, how I used the CD-ROM encyclopedia at home–when I noticed a lot of puzzled faces in the audience. I asked how many of them knew what a CD-ROM player was. About five did. I was amazed: Here were some of the most dedicated teachers in the country, and they’d never even heard of the greatest technological innovation for teaching since Gutenberg! I decided to change the whole focus of my career, from macroeconomic theories to helping people improve their lives. From now on, I would devote myself to putting technology in people’s hands that will help them learn the new things they need to know to prosper in an economy that’s changing constantly. We’re capturing the work of some of the best teachers in the country, teaching their favorite subjects. I’m doing all the disks free. I get a third of the sale price. They’re very excited. How do you teach with a CD-ROM? Let’s take the exam on the computer. I print the exam and hand it out. On a CD-ROM player, we play the exam out loud: You’re reading it and you’re seeing it, with pictures. Then we swap papers and grade it. As we’re grading it, I’m walking around with a remote control. I jump right into the presentation, and I have Lincoln or Andrew Jackson on screen as I review questions. You could have a disk on the French and Indian War for 10th graders for $29.95. Precalculus for ninth graders. Every classroom and library in the country will have a $300 CD player that works through a TV. What other opportunities are coming in education? Retailing. To give an example, I don’t believe most network marketers understand what they do. They miss the real strength of MLM–it’s not the pyramid and the little lines. It’s that they’re educating people about new products and services that will improve their lives, and getting the product or service to the people. What do you mean by “education”? Go back to the peddler of a hundred years ago, selling a new plow. The customer’s not interested until he’s taught how to use it. Then it’s wow. Network marketers don’t have to physically carry the goods anymore. That’s how Amway can be the biggest distributor of MCI in the country. Do many products need explanation? Look at your VISA bill. The majority of products you buy didn’t even exist 10 years ago. Someone had to tell you what a CD was. Think of some friend of yours who’s an “early adapter”–he’s always got the latest gadget. You love going to his house to learn about new things. The network marketing business is this: teach people about new things and let UPS deliver them. What else will be hot? Training. As people’s jobs are made obsolete by technological advances, they need to be taught new skills. People used to have one or two jobs in their lifetimes. Soon it will be six careers. Training these people is the business opportunity of the next century. I published an article suggesting we convert all the empty shopping malls into TEC centers–Training, Employment, and Continuing education–to retrain people who lost their jobs or want new ones. It’s an opportunity for employers, recruiters, trainers, drug-testing laboratories, skill-testing companies, reference-checking firms, and secretarial services. They can all prosper together while easing the shock of technological change for working people. To look at it positively, this is the first time in history you can change your life in a few years. You can become a digital CD maker in five years or less. Most people want a better job and to improve their lives. But the theories of economics they’ve been taught, they know don’t work by other observations. They don’t know what to tell their children to study in school. I’m one of the few people in economics today who says there really are answers. That comes not from economics but from my theology. I believe in a world where it is our God-given destiny to find answers. Since I’m an economist, I’ve devoted my life’s work to finding economic answers. I’m just now defining the question in terms useful to the individual. What’s the future like, in light of the President’s economic package? The President has a tremendous effect on the economy. It’s the public perception. Attitude is reality in the alchemic world. People’s attitudes are what creates the wealth to begin with. If someone’s unemployed and convinced there are jobs, he’ll run out and get a job. He’ll go after a job he wasn’t willing to take or decide he’s qualified for something he didn’t dare aspire to. The current tax bill takes from the producer, instead of giving unemployed people and the poor more incentive to find work. The biggest source of revenue for any daily newspaper is the classifieds, the largest of which are jobs. Clinton thinks we need to create jobs. First let’s fill the ones we have. Alchemy really is the key. That’s why some people make fun of Tony Robbins. They think wealth is oil, land. It’s not. Tony understands that wealth is the product of our attitude and our creativity. What’s your advice for our readers? Plan your next change now. Ask yourself: What new ideas, what new methods am I exploring today? “Dreaming is the most important part of the economy,” declares Paul Pilzer. Leaders like former CEO Dennis Mullane of Connecticut Mutual Life Insurance Co. use Pilzer to inspire their people to see opportunity where industry wisdom fears to tread. For CEO Dexter Yager (right) of $2 billion-a-year Yager Enterprises Inc. of Charlotte, N.C., Pilzer’s theories confirm what Yager has learned through experience: “When a man starts on the road to success, he’s an outlaw, he’s a nut. When he starts to have a little success, then they say he’s a little weird. When he’s really achieved success–he’s eccentric. They keep saying, ‘This guy doesn’t fit in!’ So 90 percent of the people in America are trying to fit in with people aren’t makin’ it,” says Yager.